Introducing an innovation (i.e. an enhanced recovery pathway) to an organisation can be a complex process. There will usually be a formal decision-making process at the organisational level, an evaluation phase, and then planned and sustained efforts at implementation. 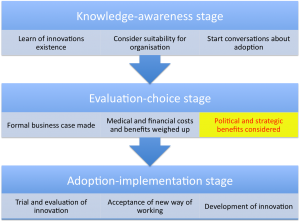 Meyer and Goes have worked extensively in examining innovations within healthcare, and the model presented here is an adaption of their scale showing the decision-making stages in the assimilation of innovations within healthcare. In our experience, it is crucial to manage the political and strategic evaluation stage successfully. Getting top level support and understanding of what you are trying to achieve is essential when you need decisions to be made. This is where describing enhanced recovery within the context of the QIPP agenda can be a useful method of ensuring that those who you need to make decisions can see the strategic and political benefits for the organisation. For more information on the QIPP agenda, visit the DoH website by clicking here where you can access an excellent case study from Yeovil District Hospital NHS Foundation Trust that details how they have successfully employed an enhanced recovery pathway.